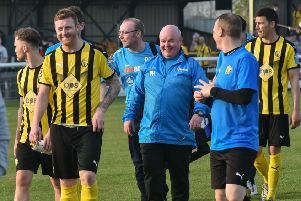 Paul Holleran is raring to go as Leamington get their friendly campaign under way with a home clash against Stafford Rangers tomorrow (3pm). However, the Brakes manager admits the manner of his side’s relegation from the Conference North last season called on all his powers of resilience going into pre-season. “It’s my 20th as a first-team coach or manager and the way last season ended it was the hardest one to come back to,” admitted Holleran. “We all needed a bit of a break and to recharge our batteries. “But we’re back and it’s the start of a very important campaign. “We have to go in and compete straight away. Evo-Stik Division One (South) side Stafford Rangers provide the opposition tomorrow and a first chance for Brakes fans to catch sight of their seven summer signings. However, Holleran said there is little to be learnt from these early skirmishes, with unavailability further hampering his preparations. “The early games are just about fitness. “This time of year you’ve still got one or two holidays, plus it’s the wedding season and we’ve got one player whose partner is having a baby. That’s the reality of pre-season. “The first two or three games will just be about getting minutes into them and a little bit of co-ordination. Brakes have confirmed a trip to Townsend Meadow on Tuesday night to take on Michael Hayden’s Racing Club Warwick side. Meanwhile, Leamington have been handed a home tie in the first qualifying round of the FA Trophy. Northern Premier League outfit Barwell FC will provide the opposition with the tie being played on Saturday, October 31. The winners of the tie will receive £2,700.